A few weeks ago, we got to talking about the meaning of marriage (one of my favorite discussions yet, in case you missed it). And no surprise here, most of you looked to your vows to articulate what marriage means. For added inspiration, a few of you even pointed to an open thread post from a few years back where we invited readers to share their vows with the community. Which got us thinking that we should ask you smart, funny, articulate women to share your own sample wedding vows. Because holy smokes, you guys have really good stuff to share. So, here’s how it works: If you’d like to share what you said when you pledged to spend your life with your beloved, do so in the comments. (And that includes those of you who, like Meg, used traditional vows in your ceremony. We want to hear your words too!) Everybody else? Get out your tissues. Or your notepads. Whichever. 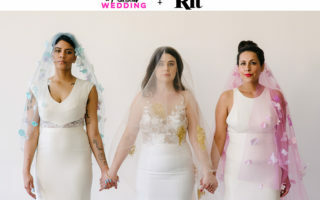 for those of you with weddings coming up who are looking to write your own vows and want a little more guidance on the subject, we recommend this great post from Jen Girdish on just that.